I don't really understand the concepts behind an object being Parcelable or Serializable, so I was not comfortable using that approach. Deconstructing the object, on the other hand, is easier but it is quite hard to manage as the number of fields in the object increases. And then I came across another solution: using Bundles. In this post, I will try to explain how to do that. In this sample project, we want to pass an instance of an AttendeeObject from our main activity to another. To better illustrate how we can use this method for different data types, an AttendeeObject will hold three pieces of information: a String name, an integer age, and a boolean indicating the person's presence. First, we construct the AttendeeObject like any old POJO. Create all the fields you want the object to contain and generate getters and setters for each. We then create the methods we would need to be able to pass, and subsequently receive, this object between activities. To pass an AttendeeObject, we would need to put it in a Bundle and pass it using Intent#putExtra(String key, Bundle bundle). Here, we simply put into a Bundle the values in the object that we want to pass. Now, we are ready to use this in our application. I created a simple app that asks the user for the three values we would need to populate AttendeeObject. I won't discuss the details of creating the layout file, but it might be worthy to note that the possible values for the Spinner are just "Yes" and "No". 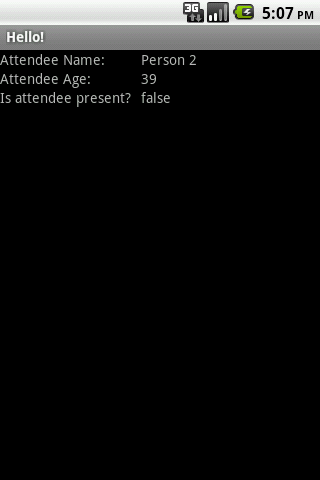 When the user clicks on the "Create Attendee" button, the application creates a new AttendeeObject based on the values in the form and adds this to an ArrayList of AttendeeObjects. When the user clicks on the "Submit Attendee" button, the app "packages" the chosen value into a Bundle and sets it as an extra to the Intent. For illustration purposes, the application always gets the second AttendeeObject in the ArrayList. // Again, the key should be in a constants file! Here's how the receiving activity looks like: Here's the complete AttendeeObject class.